I would do just about anything to get our kids to sleep well through the night, and that is how we came to buy a new bunk bed for them. They sleep better together in the same room and since the room is small, bunks were the way to go. But it couldn't be any old bunk - we were suckered for a gorgeous and fun design that is durable and well made. We chose the Argington Uffizi. I liked that it is made from sustainable hard wood and birch ply. All materials, glues, stains and finishes are 100% non-toxic and are low VOC. I find that buying furniture that is completely eco-friendly is really challenging. You have to wonder if the materials sustainable, are there any components, glues or finishes that are toxic or off-gas? If it is an upholstered item there is the big problem of fire retardants (also a problem in mattresses). Speaking of which, we had to get new mattresses for the bunk bed. The requirements were for a mattress that is thinner than the one we owned. We didn't want our little guy too high up on a huge mattress poised over the safety railing! I took this opportunity to invest in healthier, more natural mattresses. I've written before about the choices in finding an eco-friendly mattresses for children. I chose to purchase from a local company, European Sleepworks, since I was in a hurry and they had what I needed in stock. It all sounds like an ideal purchase, but one of the unforeseen surprises was the amount of packaging waste delivered with our new bed. It was shipped flat in 5 enormous boxes. Luckily my husband was clever enough to put it together. When he finished, we had so much leftover styrofoam and cardboard that our garage was full! You know how I despise styrofoam. Since there is no way to recycle it I drove it to the dump (sad as I was to do it). We have a big minivan and it was loaded to the gills with it! And it pains me to say that I later realized I could have taken it all over to Scrap, a creative arts reuse center where they accept all kinds of materials and artists find ways to use them. 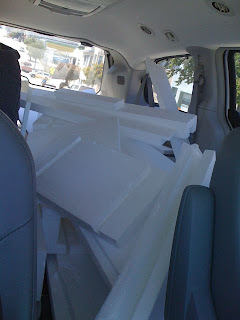 The next day I filled the minivan once again with piles of cardboard, which I lugged over to our recycling center. I understand that companies must ship the products to arrive without any damage, but I really had to wonder if there could be a better way. I felt like any good eco aspects of the bed were negated by all the packaging. Did I mention the boxes indicated the bed was produced in China? I'm not trying to insinuate that we are not loving the new bed. It is just that I am not familiar with buying "real" furniture (more of an Ikea home, here) and am surprised by the packaging that goes into making sure it arrives in good condition. In the end, the bed is a hit and the kids love it and are sleeping pretty well. We love it, for sure. I just think I will have to repent for the waste for a long time. Check out all this styrofoam! It's packed back to front in a big minivan. The cardboard was just as large a load the next day, if not larger. Good grief! thanks for the post... i personally think you can feel free to leave your eco guilt behind. you most definitely get an A for effort. plus you get multiple gold stars for sharing the experience with other mums trying to do the same... we get the benefit of learning from your experience and that is how we make wiser choices. i've been on a hunt for green furnishings too and i'm coming to the realization that something used from someone locally is probably going to be the best choice. second runner up if i just can't find something that'll work on craigslist will be a local furniture builder (who uses sustainable materials). there are two guys in the castro who have an unfinished furniture shop who seem to have a lot of knowledge and some good ideas at pretty low costs. i actually came across your blog while i was shopping for a bean bag and decided not to buy the fat boy after reading your blog regardless of how "cool" it looks. it is coated in PVC and packed full of plastic so i just won't go there... i've been searching for a comparable alternative that is eco friendly and made domestically with no such luck... i'm feeling inspired to put together a list of local resources for green things since it seems that recycled and local (sustainable) are the best choices... thanks for the inspiration. sorry about all that stinking styrofoam!! I love your new bed! I feel for you on the styrofoam--I agree; can't there be a better way? Ditto on the made in China thing. It seems like everything is made in China, even if upscale. LOVE that bunk bed - we've looked at for the future...we're typically more of an IKEA home too :) but that would be a splurge...Did u check out IKEA mattresses at all? I know those don't have the PBDE's and are reasonably priced - just curious if there was a reason you chose against them...or maybe you just wanted a local manufacturer, which would be a wonderful reason. Anyway, cool bunk beds! Hope your kids enjoy them for years - let us know how they hold up! ok those are just the coolest bunk beds EVER. i love how they're almost sculptural - the boys must be so excited! I recently came across a couple of colorful designs on more bunk beds and kids bedroom furniture. Would you mind telling me the dimensions of the room that the bed is in? It's basically just for comparison sake. Our daughters room is an "average" size, but it seems that it may be too small to fit this particular bed. thanks for the comments and ideas, everyone. 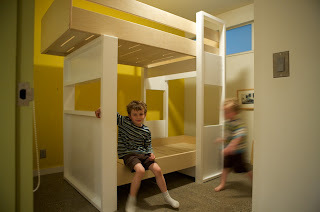 the bunk beds are in a room that is about 10' x 10'. fortunately the clothes are in built-in drawers (not visible in photo). oh, and i did not get the ikea mattresses because the ones i found were not that much more expensive and made with more natural materials, besides being made in the USA. they had a child's mattress which was fairly reasonable.